Home > Blog > Going on an activity break? Pack smart! Going on an activity break? Pack smart! At Activity Breaks, we’ve been sending groups of all shapes and sizes away on adventure holidays across Europe for years. We’ve smashed the once-popular idea of a summer holiday starting and ending on the beach by combining all imaginable forms of activities into breaks in the most beautiful locations. In almost any active holiday, you’re going to be walking. Whether that’s to the start of the cycle point, or the top of a canyon, it’s a good idea to bring a good pair of good, broken in walking shoes. It can also be worthwhile travelling in your walking shoes, as not only are airports big, but shoes take up lots of room in your suitcase! Make this a compact, well-loved pair of shoes if you have them. These are especially necessary if you are doing water sports on your break. 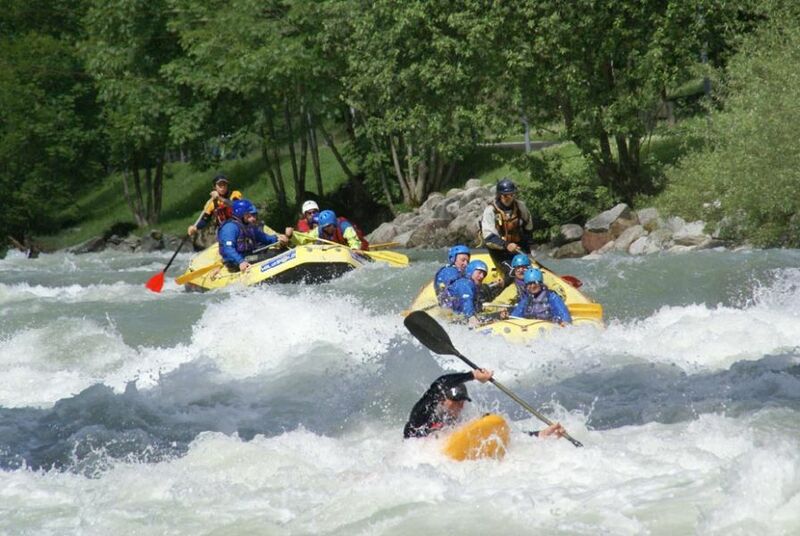 With the likes of white-water rafting, canyoning and boating, your feet will likely get wet. There is nothing worse than squelching your way back to the transfer or hotel that are going to rub. We recommend packing this spare pair in your rucksack in a plastic bag so you can slip them on before the activities and ditch them into the bag again after! This one requires little explanation! Protect your skin. We would always opt for waterproof creams as they’re more resilient, and will protect for a little longer if you’re sweating or partaking in watersport activities. Regular application is key. Certain types of mosquitoes are present in Italy and Slovenia and also on the south coasts of Spain, France and Croatia. If you’re going to be out a lot, and find that you attract mosquitoes, then we would suggest packing DEET. These sprays are available in most high-street pharmacies so don’t get ripped off at the airport! For Europe, your protective spray doesn’t need to be very strong, anything up to 30% DEET works well. None of these areas are malarial zones, so sprays aren’t a necessity, but you might argue otherwise if you’re dealing with some nasty bites! This can be a great one to pack in a rucksack if you’re going to be doing water-sports or multi-activities. Indeed, it’s brilliant for any active holiday, especially if you have booked multiple accommodation and will be travelling around a fair bit. These towels can be rolled up very small, dry very quickly and are available from most outdoor stores. This is a must for any active holiday. A small backpack that you can pack the necessities in. If you’re like us, then you’ll want snacks and drinks throughout the day. Backpacks are also great for carrying towels, spare shoes, bottles of water, gadgets and that those all-important travel documents. Goes hand-in-hand with active holidays. Save yourself from constantly buying bottles of water and just bring a refillable water bottle and keep it in your backpack, you will also be doing the planet a favour by limiting your use of single-use plastics. Also good for the airport, take it through security empty and fill up on the other side. Get a filter bottle like a water well or life straw and you can fill them up from streams and lakes, they filter out the bacteria so you never have to worry about where to fill up next. They also remove the bad taste of overly chlorinated tap water (and the chlorine). Really useful if you’re camping or staying at an eco-resort. If you’re hiking, cycling or trekking, then it might be handy to pack a small head or hand torch too. If you’re self-catering or camping, then bring your brand! You’re more than likely to get dirty on a go-active holiday, and it’s smarter to wash clothes while you’re travelling rather than risk the baggage limit and pack for all eventualities. Either find a laundry bar soap that you will be able to use again whenever you go away in the future, or use a small refillable plastic bottle and decant some of your home washing powder/liquid into it. Try to reuse plastic where possible and don't buy single-use travel packs. Have a look at our recent post on travel gadgets and check out the Scrubba wash bag, which can be handy if you only have a small bathroom sink to wash things in. ...and charger packs in general, more and more important as we grow ever more attached to our phones and gadgets! If you’re going to be spending most of your time out of the hotel at your activities, or maybe you’re camping, then this is a much-needed investment. Especially if you’re snap-happy like us!